Milton Keynes Lightning’s two year expedition into the top flight of British ice hockey drew to a close with an emotional farewell at Planet Ice on Sunday in which Sheffield Steelers’ large army of travelling supporters played their part. Twenty-four hours earlier more than two coaches full of Lightning fans had made the trip to Cardiff Devils, only to see the team demolished in a 9-1 defeat to the league title contenders who then went on to a shock 3-1 defeat at Coventry Blaze on Sunday. That result allowed Belfast Giants to claim the Elite League crown while celebrating their annual awards night. Lightning had started the trio of weekend games with a 5-3 loss to Manchester Storm at Planet Ice on Friday. So sadly the dream is over – for now – Lightning’s owners discovering what the bosses of Basingstoke Bison, Bracknell Bees and Hull’s former team had found out before them, life in the top echelons requires deep pockets to sustain. Only with the financial backing Guildford Flames are said to boast can a southern-based small rink team survive. It’s back next season to doing battle with the aforementioned clubs in a National League which may be of similar quality to Lightning’s former home in the English Premier League – apart from the absence of three of five imports. This year’s Lightning players have become heroes in their own way – battling against the odds in a team which was seriously under-resourced from the moment the first puck dropped in August. Following coach Doug McKay’s departure in November his replacements Ryan Lannon and more especially Tim Wallace moulded the depleted squad into a team which was stronger than the sum of its parts. Killeen was caught out again by Jordan Owens’ shot which crashed in from the left after 25mins 29secs while Sheffield were short-handed. Ryan Martinelli shot over Killeen’s arm high into the goal to take Sheffield’s tally to three without reply on 34mins 40secs. It was not until Ben O’Connor was called for holding in the 50th minute that Lightning bagged their consolation goal – Golovkovs’ angled pass finding Wallace just inside the blue line to blast through traffic at 52mins 56secs. With Killeen off the ice in favour of the extra skater John Armstrong scored on the empty net with 1min 36secs remaining. 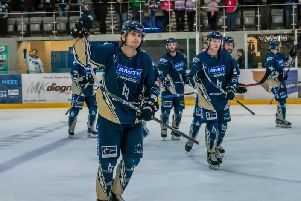 Cardiff had seven different scorers in their win against Lightning – the visitors’ only goal coming from James Griffin while Michael Fine, Wallace and Cole Shudra were on target in the loss to Manchester.